We chat with a Los Angeles-based fashion designer, who grew up in Ohio, about her growing design business that’s catching the eye of high end retailers, celebrities and even TV shows. Natalia Fedner, Founder of Natalia Fedner Design, one of the few genuine haute couture design houses in the U.S.
Natalia Fedner has an extensive background in the fashion industry. She’s currently based in Los Angeles but the Ukranian-born design mastermind grew up in Columbus before receiving her education in Paris and New York. Fedner says that as early as age 4 she recalls an interest in designing and inventing, when she started collecting pretty colored wires that were left as trash outside of a local telephone communications company in her native Chernovtsy, Ukraine. After collecting the wires, she would turn them into bracelets for herself and friends, and thus the budding inspiration of one of the country’s few, genuine haute couture design houses, Natalia Fedner Design, was born. Fedner’s inspiration and desire for design has led her down a prestigious path. Following her graduation from Parsons School of Design, Natalia worked for Calvin Klein, Donna Karan and Marc Jacobs. “My designs have been on runways in Paris and New York, and featured in the holiday windows of the original Saks Fifth Avenue in New York City,” says Fedner. 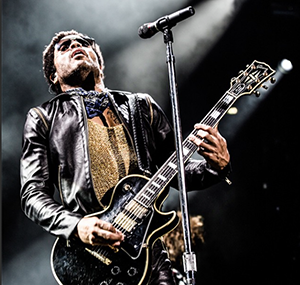 Lenny Kravitz wearing Fedner’s designs. Fedner also competed on Project Runway: Under The Gunn, where she created the first working mechanical dress in the history of the series. She says that in addition to her design accolades, she’s also created and produced video fashion content for Getty Images, Perez Hilton, Defy Media and Magical Elves. Jennifer Lopez wearing Natalia Fedner Design. Fedner’s designs are a top-rated choice for many celebrities. She currently creates avant garde designs and jewelry for celebrities including Charlize Theron, Jennifer Lopez, Kim Kardashian, Lenny Kravitz, Giuliana Rancic, Pamela Anderson, Steve Aoki, Shakira, Fifth Harmony and Rose McGowan. Fedner says there’s a lot to look forward to in the near future for her business. She’ll be releasing new textiles that she hasn’t even revealed publicly yet. Fedner adds that her designs will be in boutiques in Miami and New York. To add to her celebrity, Fedner’s designs are featured in Pamela Anderson’s book “Raw,” which comes out in September. The designs will also be featured in upcoming Steve Aoki music videos as well as editorials that will be highlighted in high profile magazines. To learn more about Natalia Fedner Design, click here. You can also check out Instagram to see the latest collabs, projects, editorials and behind-the-scenes of Fedner’s atelier.